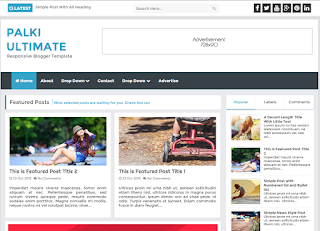 Palki Ultimate Blogger Template is a responsive blogger templates and SEO ready blog style blogger template. If you running a blog site, then Palki Ultimate is your perfect choice for your blog site. Simple and clean design make your blog more attractive. You can stick 2 important posts as a featured posts on Homepage (using specific label). Palki Ultimate has more attractive features these are make your blog more beautiful.